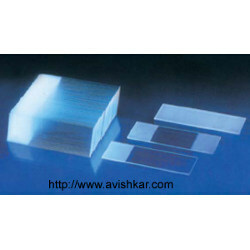 Our product range includes a wide range of frosted slides, cavity vdrl slides, printed slides and plain micro slides. Odd sizes for all the items will be quoted and supplied on request. All products are cleaned and ready to use. 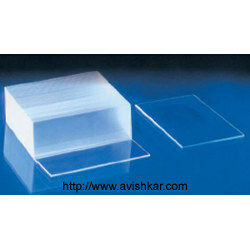 Micro slides with cavities & rounded edges are made to cater to specific as well as varied needs of clients. Pack: Each Packet of 10 nos. Edges are rounded to give better smear. Spherical concavities are 15mm in diameter x 0.5 mm deep with bevelled and polished edges. For Kline, B.J.L., V.D.R.L. & other serodiagnostic tests. 12 Concavities, each 21mm in diameter x 4mm deep. Surface of slide is frosted to provide smooth writing. Surface edges & corners are bevelled & polished. Micro slides are printed in standard white coating & also various colour coatings which offer alternative marking method to frosted micro slides. Pack: Per Packet 20 nos. One end has 19mm printed surface on both the sides for marking. 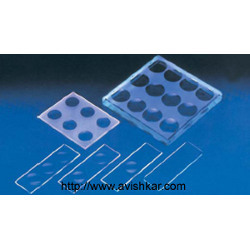 Standard matter as per regular requirement of the laboratory is printed for easy marking. 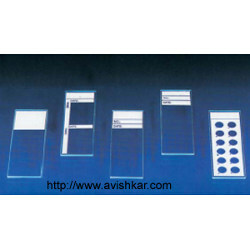 Micro slides can be printed specially as per the requirement of hospital/laboratory with their name, logo etc. Micro slides is printed with 12 wells which make your work easier, faster & accurate. Standard packing is 50 nos. In a packet duly gelatined, then 10 packets in a corrugated box seaaled & likewise 10 corrugated boxes in a strong outer corrugated box. I.E. Packing of 100 packets in a corrugated box.